This is an example of thoracopagus. 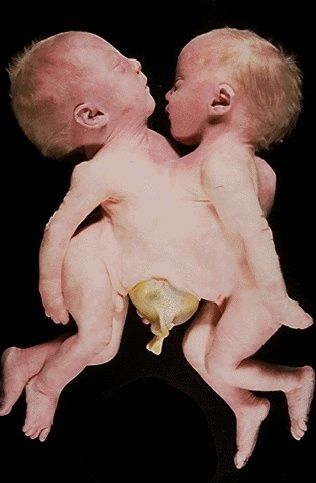 Note the large omphalocele in the lower abdomen shared by these monozygous twins. These twins shared a heart and liver and several other organs were partially fused. Attempts at separation of such twins can either be viewed as heroic new technology or expensive futility. The survival rate with significant fusion of organs is essentially nil.